Molly is a twenty-something fashion graduate with an eye for design and an affinity for extravagance. Her obsession with beautiful things holds no bounds. (She’ll swoon over frocks, logos, even miniature antique elephants. You name it, she’s worshiped it.) Born and raised in Minnesota, she identifies with Midwest sensibilities, but embraces East Coast style. In other words, her shoe collection is flat and all black. All of the Things birthed out of a love for aesthetically beautiful things in all realms, coupled with a love-connection to dialogue from an episode of GIRLS. H: Please don’t tell anyone this, but I want to be happy. J: Of course you do, of course you do, everyone does. H: Yeah, but I didn’t think that I did. I made a promise such a long time ago that I was gonna take in experiences, all of them, so that I could tell other people about them and make me save them; but it gets so tiring trying to take in all of the experiences for everybody – letting anyone say anything to me. Then I came here. And I see you. And you’ve got the fruit in the bowl in the fridge with the stuff in the room and you’re touching me that way that . . .
And I realize, I’m not different. You know? I want what everyone wants. I want what they all want. I want all of the things. Of course, I don’t relate to all of Hannah’s words. But the idea that tangible things can bring a sense of well-being and happiness is something that I have always felt. 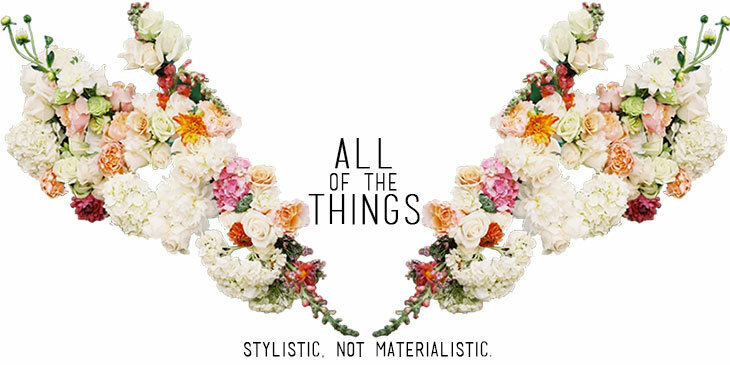 It’s not materialistic – it isn’t. It’s something more than that. It’s a deep appreciation for great design and the innate beauty of ‘things.’ It’s a sense of stability and a sense of home; a sense of satisfaction. See, GIRLS got its start on television at a time that coordinates quite well with my life. Topics all center around young women trying to find their way in the difficult, transitional time between college and stable adulthood. I understand that, at this time, I’m not supposed to have access to all of the things that I love and lust for. But that makes me no less qualified to understand their power. Hannah gets a glimpse of the life she never knew she could have, and it is filled with lovely belongings all wrapped up in a renovated Brooklyn brownstone. Owning nice things and USING them every day can enrich your life. Switching on my Tiny Teardrop Jonathan Adler lamp makes my soul feel light. Boiling water in my Hario kettle brings liveliness to my morning. Opening the pages of a Russell + Hazel notebook is a thrill. Unscrewing the cap on my Aesop face cleanser is day-changing. It can be confusing because there are different schools of thought here. There is a long-enduring stigma attached to owning and appreciating tangible things. It has become fashionable and is thought sensible to flush your life of belongings and live simply (think, 1,000 square foot home structures). And that can work for some. But to a certain degree, I strongly believe in the power of ‘things.’ It’s not that I want clutter; in fact, I’m pretty cautious about straying from it. It’s not that I desire a mansion. I’ve said many times that a smaller, well-built home is my dream. It’s that I want each functional item that I own to be beautiful. And I want each beautiful, non-functional item to be of quality, to have a story and a design sense, to be in good taste. Less is more, but what remains is happiness-evoking – ‘things’ that bring joy; ‘things’ that bring meaning. Whether it’s beauty, style, home interiors, or paper goods, all of the ‘things’ on my blog generate connectivity to the life that I imagine. By profiling and documenting the things that I love, I hope to manifest a lifestyle that I’m attracted to and inspire others to do so, too. If part of finding happiness is appreciating beautiful things, so be it!